The Houlton Building Complex consists of three buildings: The Sheriffs Office Building, The Aroostook County Jail and the Aroostook County Superior and District Court Building. Located on the corner of Military and School Streets, houses Aroostook County Law Enforcement Operations, Dispatching Center, the Maine Drug Enforcement Agency, and the University of Maine Cooperative Extension. Located on the corner of Military and Broadway Streets and houses the Correction Division of the Aroostook County Sheriff's Department. The Jail Administrator, Transportation Division, Community Corrections and Jail Nurse also maintains an office in this building. Located on the corner of Military and Court Streets, is listed in the Register of National Historic Buildings. 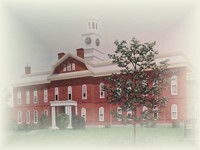 The Maine Superior and District Courts and their offices; Aroostook County Registry of Deeds (South); Registry of Probate, District Attorney's and Building Maintenance Offices are all located in this building.